The workpiece pallet acts as a carrier for workpieces through the conveyor system. With fixturing, it serves to hold the workpiece for processing at a workstation. 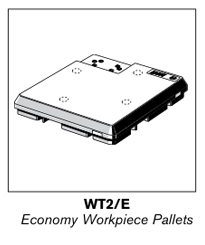 Positioning bushings allow the pallet to be located in a station with an accuracy of ±0.05 mm when used with a lift-position unit. 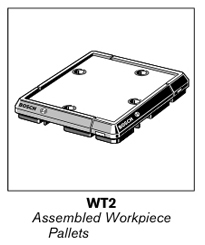 Mechanical or RF identification and data storage modules can also be mounted to the support plate. 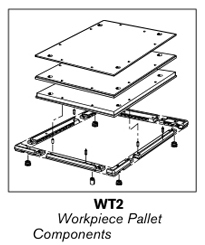 Workpiece pallets can be ordered fully assembled with steel, aluminum or heavy duty aluminum support plates. 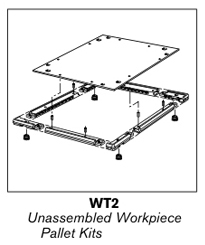 Workpiece pallet components can also be purchased unassembled for on-site assembly. Ordering unassembled pallet kits or pallet components make it possible to perform the required machining to the support plate prior to pallet assembly.